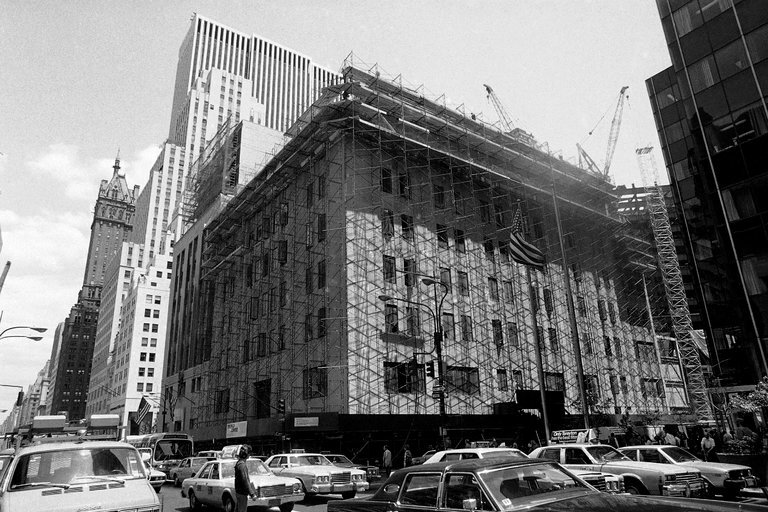 The Bonwit Teller building in 1980, as it was being demolished to make way for the new Trump Tower. Trump Tower was Mr. Trump’s second solo project after leaving his father’s real estate company, which developed working- and middle-class housing in Queens and Brooklyn. But before he could build a glassy condominium tower on what he considered to be a “Tiffany” of locations, Fifth Avenue and 56th Street, Mr. Trump had to demolish a venerable department store, the 12-story Bonwit Teller building. For the demolition work, Mr. Trump hired an inexperienced contractor, William Kaszycki of Kaszycki & Sons, for $775,000. Mr. Kaszycki specialized in window and job-site cleaning. His company was renovating an adjoining building for Bonwit Teller, where he employed undocumented Polish workers. Mr. Trump would later testify that he never walked into the adjoining building or noticed the Polish workers. But a foreman on the job, Zbignew Goryn, testified that Mr. Trump visited the site, marveling to him about the Polish crew. The demolition began in January 1980. It was hard, dirty work, breaking up concrete floors, ripping out electrical wiring and cutting pipes while laboring in a cloud of dust and asbestos. A smaller group of union demolition workers, who were paid much higher wages and, unlike the Poles, overtime, often made fun of their Polish co-workers, according to the testimony of Adam Mrowiec, one of the Polish laborers. “They told me and my friends that we are stupid Poles and we are working for such low money,” he said. In 1998, Wojciech Kozak described to The New York Times the backbreaking labor on the job. 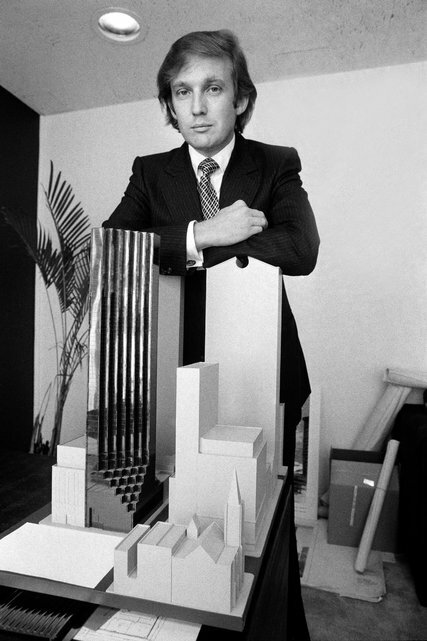 Donald Trump posed with a model of Trump Tower in 1980.
bring down the building that had previously stood on the site. Today, Mr. Kozak, now 75, lives at the O’Donnell-Dempsey Senior Housing building in Elizabeth, N.J. He has blue eyes and a strong handshake, but speaks through a special device because he had a tracheotomy for cancer. He proudly showed off his citizenship papers, dated Nov. 3, 1995. Mr. Kozak still recalls the work, and seeing Mr. Trump at the site in 1980. But Mr. Kaszycki stopped paying the men, and they eventually took their complaints to a lawyer named John Szabo. Mr. Szabo went to Thomas Macari, a vice president of the Trump Organization, threatening to place a mechanic’s lien on the property if the men weren’t paid. According to testimony, Mr. Macari began paying the men in cash himself. The delays and disruptions were adding to the pressure on the Trump Organization to meet its deadlines. One evening, Joseph Dabrowski testified, Mr. Trump arrived on site to tell the workers that he was taking charge. “I am telling you for the last time that Trump told us, ‘If you finish this fast and I will pay for it,’” Mr. Dabrowski recalled in court. Mr. Trump, however, testified that he did he not remember that there were undocumented Polish workers on the job, or signing paychecks for the crew. “I really still don’t know that there were illegal aliens,” Mr. Trump said on the stand. Mr. Trump did, according to Mr. Szabo, have his lawyer call Mr. Szabo with a threat to call Immigration and Naturalization Service to have the men deported. Mr. Szabo got the Labor Department to open a wages-and-hours case for the men, which ultimately won a judgment of $254,000 against Mr. Kaszycki. Mr. Kaszycki had signed a contract with Local 79 of the House Wreckers Union. But while Mr. Kaszycki or Mr. Trump paid into the union welfare funds for the handful of union workers on the job, they had not done so for the bulk of the work force, the undocumented, nonunion Poles. A union dissident and former boxer, Harry Diduck, brought a case in federal court in 1983 against Mr. Kaszycki and, eventually, Mr. Trump and others, claiming that Mr. Kaszycki, the union president and Mr. Trump had colluded to deprive the welfare funds of about $600,000. A judge ruled that Mr. Trump was a legal employer of the Poles, but both sides appealed elements of his decision, with the total the welfare funds could get reduced to $500,000. On the eve of a second trial, Mr. Trump settled. Most of the records of the litigation were placed in a federal storage building where Time Inc. unearthed them in 2016. But the settlement documents remained under seal. After Judge Preska ordered them released, it turned out that two of the documents had been destroyed in routine housecleaning at the court. Now that the documents have been released, Ms. Sloan said that “the settlement we obtained recovered 100 percent of the maximum amount plaintiffs could recover,” plus lawyers fees and costs. “When you get one hundred cents on the dollar in a settlement, that is a great settlement,” Ms. Sloan and Lewis M. Steel, another of the plaintiffs’ lawyers, said in an email.